Myth 5.5: The Terminal Value ate my DCF! When you complete a discounted cash flow valuation of a company with a growth window and a terminal value at the end, it is natural to consider how much of your value today comes from your terminal value but it is easy to interpret this number incorrectly. First, there is a perception that if the terminal value is a high proportion of your value today, the DCF is inherently unreliable, perhaps a reflection of old value investing roots. Second, following up on the realization that a high percentage of your current value comes from your terminal value, you may start believing that the assumptions that you make about high growth therefore don't matter as much as the assumptions you make in your terminal valuation. Neither presumption is correct but they are deeply held! If the terminal value is a high percent of value, your DCF is flawed! Note that no matter what time period you use in your assessment, the bulk of your return has taken the form of price appreciation and not dividends. Consequently, you should not be surprised to see the bulk of your value in a DCF come from your terminal value. In fact, it is when it does not account for the bulk of the value that you should be wary of a DCF! Note that assuming a much higher growth rate and return on equity in the first five years has a large impact on my terminal value, even though the terminal growth rate remains unchanged. This effect will get larger for high growth firms and for longer growth periods. The conclusion that I would draw is ironic: as the terminal value accounts for a larger and larger percent of my current value, I should be paying more attention to the assumptions I make about my high growth period, not less! If you are valuing equity in a going concern with a long life, you should not be surprised to see the terminal value in your DCF account for a high percentage of value. Contrary to what some may tell you, this is not a flaw in your valuation but a reflection of how investors make money from equity investments, i.e., predominantly from capital gains or price appreciation. You should also be aware of the fact that even though the terminal value will be a high proportion of current value, you should still pay attention to your assumptions about cash flows and growth during your high growth period, since your terminal value will be determined largely by these assumptions. Myth 5.4: Negative Growth Rates forever? Impossible! As you peruse discounted cash flow valuations, it is striking how infrequently you see projections of negative growth into the future, even for companies where the trend lines in revenues and earnings have been anything but positive. Furthermore, you almost never see a terminal value calculation, where the analyst assumes a negative growth rate in perpetuity. In fact, when you bring up the possibility, the first reaction that you get is that it is impossible to estimate terminal value with a negative growth rate. 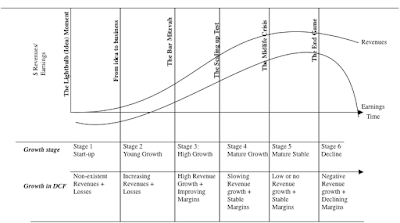 In this post, I will present evidence that negative growth is neither uncommon nor unnatural and that the best course, from a value perspective, for some firms is to shrink rather than grow. Negative Growth Rates: More common than you think! The problem with this life cycle perspective is that the global market place is not big enough to accommodate these ever-expanding behemoths. It follows, therefore, that there have to be companies (and a significant number at that) where the future holds shrinkage rather than growth. Fitting this perspective back into the corporate life cycle, you should be using a negative growth rate in revenues and perhaps declining margins to go with those shrinking revenues in your valuation, if your company is already in decline. 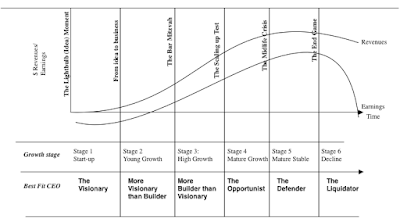 If you are valuing a company that is mature right now (with positive but very low growth) but the overall market is stagnant or starting to decline, you should be open to the possibility that growth could become negative at the end of your forecast horizon. There is an extension of the corporate life cycle that may also have implications for valuation. In an earlier post, I noted that tech companies age in dog years and often have compressed life cycles, growing faster, reaping benefits for shorter time periods and declining more precipitously than non-tech companies. When valuing tech companies, it may behoove us to reflect these characteristics in shorter (and more exuberant) growth periods, fewer years of stable growth and terminal growth periods with negative growth rates. If you do assume negative growth, though, you have to examine whether as the firm shrinks, it will be able to divest assets and collect cash. If the answer is no, the effect of negative growth is unambiguously negative and the terminal value will decline as growth gets more negative. If the answer is yes, the effect of negative growth in value will depend upon how much you will get from divesting assets. If you assume that there are assets that are being liquidated as the firm shrinks, you have to estimate the return on capital on these assets and compute a reinvestment rate. If the assets that you are liquidating, for instance, have a 7.5% return on invested capital, the reinvestment rate will be -66.67%. Put simply, the same rule that governs whether the terminal value will increase if you increase the growth rate, i.e., whether the return on capital is greater than the cost of capital, works in reverse when you have negative growth. As long as you can get more for divesting assets than as continuing investments (present value of cash flows), liquidating them will increase your terminal value. 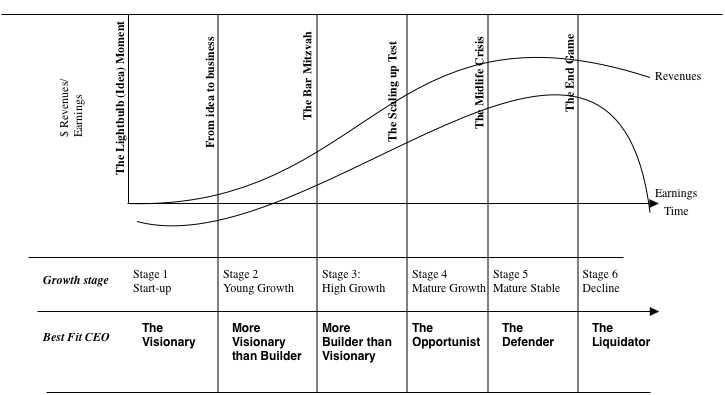 A visionary at the helm is a huge plus early in corporate life, but it is skill as a business builder that allows young companies to scale up and become successful growth companies. As growth companies get larger, the skill set shifts again towards opportunism, the capacity to find growth in new places, and then again at mature companies, where it management’s ability to defend moats and competitive advantages that allow companies to harvest cash flows for longer periods. In decline, it is not vision that you value but pragmatism and mercantilism, one reason that I chose Larry the Liquidator as the role model. It is worth noting, though, that the way we honor and reward managers follows the growth advocate rule book, with those CEOs who grow their companies being put on a much higher pedestal (with books written by and about them and movies on their lives) than those less ambitious souls who presided over the gradual liquidation of the companies under their command. I believe that the primary reason that we continue to stay with positive growth rates in valuation is behavioral. It seems unnatural and even unfair to assume that the firm that you are valuing will see shrinking revenues and declining margins, even if that is the truth. There are two things worth remembering here. The first is that your valuation should be your attempt to try to reflect reality and refusing to deal with that reality (if it is pessimistic) will bias your valuation. The second is that assuming a company will shrink may be good for that company's value, if the business it is in has deteriorated. I must confess that I don't use negative growth rates often enough in my own valuations and I should draw on them more often not only when I value companies like brick and mortar retail companies, facing daunting competition, but also when I value technology companies like GoPro, where the product life cycle is short and it is difficult to keep revitalizing your business model. Myth 5.3: Growth is good, more growth is better! The perils of holding all else constant in perpetual growth equations and playing with individual inputs, not only leads to the use of impossibly high growth rates but also inflates the importance of growth in the terminal value estimation. 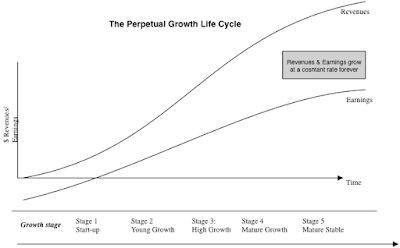 Growth is not free and it has to be paid for with reinvestment and in the terminal value equation, this effectively means that you cannot leave cash flows fixed and change the growth rate. As the growth rate increases, even within reasonable bounds, the company will have to reinvest more to deliver that growth, leading to lower cash flows, thus making the effect on value unpredictable. Changing the growth rate will have two effects: it will change the cash flow (by altering reinvestment) and change the denominator, and it is the net effect that determines whether and how much value will change. Tying growth to reinvestment leads us to a simple conclusion. It is not the growth rate per se, but the excess returns (the difference between return on invested capital and the cost of capital) that drives value. In the table below, I take much of the hypothetical example from above (a company with expected operating income of $100 million next year and a cost of capital of 10%) and examine the effects of changing growth rate on value, for a range of returns on capital. Note that as you increase the growth rate in perpetuity from 0% to 3%, the effect on the terminal value is unpredictable, decreasing when the return on invested capital < cost of capital, unchanged when the ROIC = Cost of capital and increasing when the ROIC> Cost of capital. In fact, you an just as easily construct an equity version of the terminal value and show that the growth rate in equity earnings can affect equity value only if the ROE that you assume in perpetuity is different from your cost of equity. There are a few valuation purists who argue that the only assumption that is consistent with a mature, stable growth company is that it earns zero excess returns, since no company can have competitive advantages that last forever. If you make that assumption, you might as well dispense with estimating a stable growth rate and estimate a terminal value with a zero growth rate. While I see a basis for the argument, it runs into a reality check, i.e., that excess returns seem to last far longer than high growth rates do. Thus, your high growth period has to be extended to cover the entire excess return period, which may be twenty, thirty or forty years long, defeating the point of computing terminal value. It is for this reason that I adopt the practice of assuming that excess returns will move towards zero in stable growth and giving myself discretion on how much, with zero excess return being my choice for firms with few or no sustainable competitive advantages, a positive excess return for firms with strong and sustainable competitive advantages and even negative excess return for badly managed firms with entrenched management. If you follow the practice of tying growth to reinvestment, you will be well-armed against some of the more dangerous practices in terminal value estimation. Note that just growing out the FCFF yields a value today of only $605 million, about half of the (right) value that you get with a recomputed FCFF. 2. 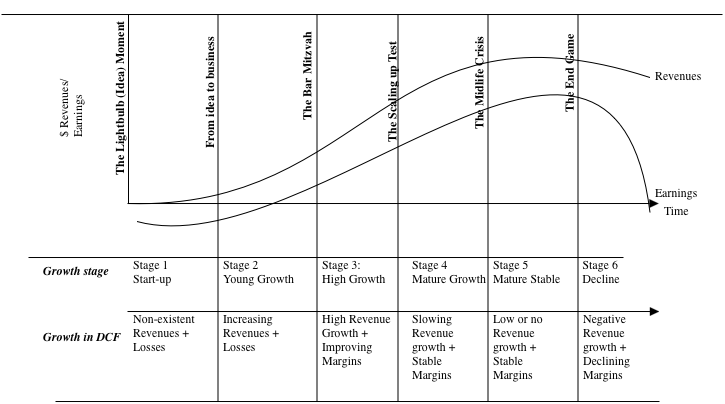 Stable Growth firms don't need to reinvest: I am not sure what the roots of this absurd practice are but they are deep. Analysts seems to be willing to assume that when you get to stable growth, you can set capital expenditures = depreciation, ignore working capital changes and effectively make the reinvestment rate zero, while allowing the firm to continue growing at a stable growth rate. That argument fails at two levels. The first is that if you reinvest nothing, your invested capital stays constant during your stable growth period, and as operating income rises, your return on invested capital will approach infinity. The second is that even if you assume a growth rate = inflation rate, you will have to replace your existing productive assets as they age and the same inflation that aids you on your revenues will cause the capital expenditures to exceed depreciation. It is conventional wisdom that it is the growth rate in the perpetual growth equation that is the most significant driver of the resulting value. That may be true if you hold all else constant and change only the growth rate, but it is not, if you recognize that growth is never free and that changing the growth rate has consequences for your cash flows. Specifically, it is not the growth rate per se that determines value but how efficiently you generate that growth, and that efficiency is captured in the excess returns earned by your firm. Myth 5.2: As g-> r...To Infinity and Beyond! The nominal GDP growth rate was about 0.74% higher than the risk free rate over the entire period (1954-2015), but it has lagged the risk free rate by 0.58% since 1981. I know this table, by itself, proves nothing, but there is reason to heed to the link. In the last sixty years in the United States, nominal interest rates and nominal growth have been closely tied to each other, with an increase in one tied to an increase in the other. It is true that there is evidence in the data, especially in the 1954-1980 time period, that real growth can exceed real interest rates for extended periods, and economic intuition provides a rationale for why. If those who take no risk earn the riskfree rate, the economy, at least on average and over long time periods, has to deliver a little bit more to reward the risk takers. However, not only can that differential not be a large number but it is also worth remembering that the nominal growth rate is the growth rate in the entire economy, composed of both mature and growth companies. If you allow every mature company to grow at the rate at which the economy is growing, where does the growth come to sustain the growth companies in the economies? Put differently, setting the growth rate for mature companies below the growth rate of the economy cannot hurt you but setting it above that of the economy can cause valuations to implode. I'll take my chances on the former! If you are not convinced by this reasoning, I will offer another reason for tying the two numbers together. When you use a riskfree rate in a valuation, you are implicitly making assumptions about economic growth and inflation in the future and if you want your valuation to be consistent, you should make similar assumptions in estimating your cash flows. Thus, if you believe, the risk free rate today is too low or even negative (because the central banks have kept it so), and you use that risk free rate to come up with your discount rates, you have to keep your growth rate in perpetuity very low or negative to keep your valuation from imploding. That is the point that I was making in my post on negative interest rates. In the last decade, as interest rates have hit historic lows, the danger of this mismatch has become greater. Analysts have been quick to shift to using lower risk free rates (to 2% or lower) in their discount rate calculations while continuing to use nominal growth in the US economy (5-6%) as the cap on their growth rates. That is a recipe for disaster!